Despite four rate hikes by the Bank of Indonesia since May, the Indonesia’s rupiah slid to a two-decade low, falling to 14,750 per dollar, a level last hit during the Asian Financial Crisis of 1998, and just shy of an all time low, spurring yet another intervention from the central bank as the contagion from the collapse in Argentina and Turkey has turned the market's attention on emerging markets with current account deficits. Indonesia's benchmark bond yields rose 10 basis points to the highest level since 2016, while the Jakarta Composite Index slipped as much as 1.3%. The plunge took place despite a notice from the central bank that it was intervening in the foreign exchange and bond markets, according to Nanang Hendarsah, executive director for monetary management. 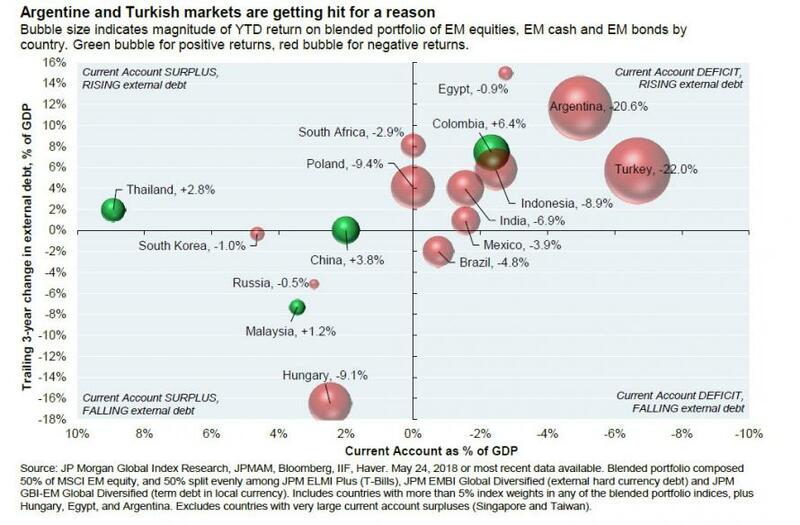 As a reminder, after Argentina and Turkey, Indonesia is next to be hit on this chart from JPM we first showed at the start of June, which plotted countries with a current account deficit and rising external debt. The rupiah is down 7.8% this year, and first came under pressure from a resurgent greenback and climbing U.S. Treasury yields. The escalating trade war between the U.S. and China, followed by the Turkey turmoil then added to its woes. It’s the second-worst performing major Asian currency this year, after the Indian rupee. 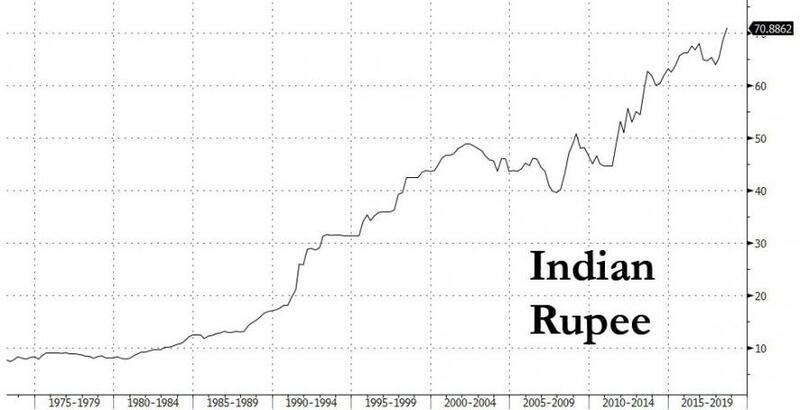 Meanwhile, over in India, the rupee also fell to a new record low, trading 71.035 against the dollar, set for the biggest monthly decline in three years, although so far India's capital markets excluding FX have barely been affected, with the Nifty trading just shy of all time highs. As Bloomberg notes, as investors liquidated Turkish and Argentinian assets, countries with large current-account deficits such as Indonesia and India have also seen their currencies and bonds come under selling pressure. The rout in the Argentinian peso and Turkish lira end the recent stability bought by Bank Indonesia’s four rate hikes since mid-May, which has led to a return of foreign funds into its debt market. The recent sell-off will put more pressure on the central bank to raise rates again, according to Bank of America: "Just goes to show the external environment remains tough for Indonesia as we had anticipated," said Mohamed Faiz Nagutha, an economist at Bank of America Merrill Lynch in Singapore. "We continue to expect more hikes for sure, with the exact magnitude to be determined by external rather than domestic fundamentals." 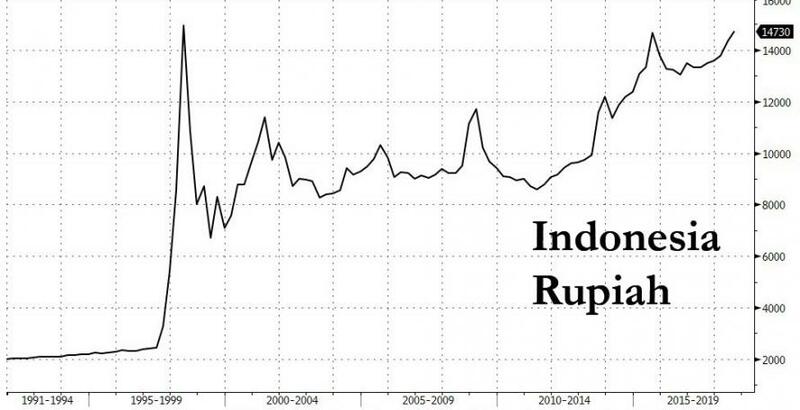 Meanwhile, the pressure on the rupiah continued to rise as Indonesia’s current-account deficit rose. The shortfall increased to $8 billion in the second quarter, or 3% of GDP, from $5.7 billion in the previous three months, according to the latest central bank data. “For Indonesia, it’s the current-account deficit that we need to manage,” said Suahasil Nazara, head of fiscal policy office at the Finance Ministry. “The ultimate fix is through our structural reforms, allowing better and more conducive business environment especially for manufacturing and upstream industries." Of course, it is those structural reforms that are so unpopular, which is why every EM chooses to use monetary policy first - or in the case of Turkey, nothing at all. Still, it was not all bad news: despite the rupiah’s selloff, investors can take heart in “some underlying improvement in the Indonesian economy” since the 1998 Asian crisis, said Michael Every, head of financial markets research for Rabobank Group in Hong Kong. "I don’t think there’s as much downside risk to the rupiah until we see China devalues its currency significantly." That in turn depends entirely on Trump.